Raccoons (Procyon lotor) are common throughout much of the United States and are important furbearers. In the wild, they prefer living near streams, rivers, lakes and marshes, and they require trees, brush and other cover. They usually make their homes in hollow trees, logs, rocky crevices or abandoned animal burrows. Raccoons are opportunistic feeders, taking whatever is available. Fruits, berries, acorns, insects, fish, mollusks, grasshoppers, mice, birds, snakes, eggs and crayfish make up the bulk of their diet. They also feed on corn, sorghum and other cultivated farm crops. Raccoons are intelligent and can adapt readily to living in close association with people. They are very common in urban areas, but since most of their foraging is done at night, they often go undetected. In urban communities, raccoons live virtually any place that offers protection. The most common sites are in attics and chimneys, or under houses and woodpiles. Since raccoons are omnivorous, there is a wide variety of food available to them in urban areas. Dog and cat food, fruit trees, bird seed, vegetables in home gardens, and garbage in trash cans provide an easy meal. Raccoons can cause considerable damage. In rural areas, they may raid poultry houses, feed on farm crops, and may kill young lambs and kid goats. In urban areas, damage occurs mainly to attics and roofs, but other damage may include ruining gardens, eating fruit on trees, digging up yards, or exposing people or pets to transmissible diseases. Several different types of parasites and diseases affect raccoons such as fleas, ticks, lice, roundworms, tapeworms, distemper, tuberculosis, mange and rabies. Grayish brown body with black mask across face and black rings around the furred tail. One litter per year, usually born in February or March. Trapping is the most satisfactory way to remove raccoons. In urban areas, it is advisable to use cage traps. This allows pets, if accidentally caught, to be released. A cage trap, either constructed or purchased from a feed or hardware store, with dimensions of at least 10 inches x 12 inches x 36 inches is adequate. Bait these traps with peanut butter, fruit, whole un-cracked eggs, marshmallows, or cookies. Attach a bright shiny object (such as a bright button or aluminum foil) to the trap pan. The raccoon’s curiosity causes him to investigate the shiny object on the trap pan. When placing the traps outside, using a non-meat bait reduces the likelihood of catching cats or small dogs. 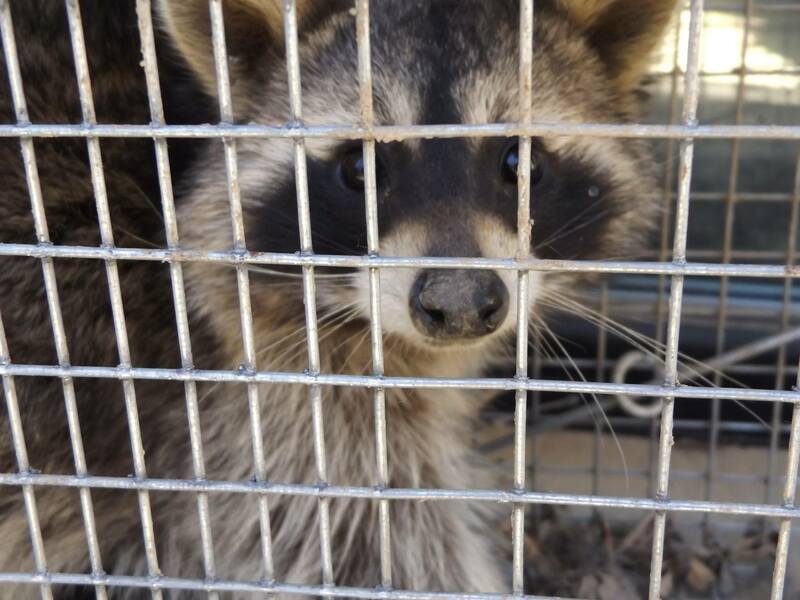 Place the trap on a sheet of plywood or similar surface because raccoons normally dig up grass or anything else within reach and pull it into the trap. In rural areas, leghold traps or shooting may be more effective. There are no repellents, toxicants or fumigants currently registered for raccoon control. Where raccoons are a problem, several things can be done to discourage them. Screen attic and foundation vents to prevent animals from getting in or under the house. Installing an animal proof chimney cap will keep raccoons from entering and nesting in a chimney. Reducing the food and water supply also helps to discourage raccoons. Feed pets in the morning and clean up all leftovers. Empty pet water bowls at night or place them out of the raccoons’ reach. Take bird feeders in at night or place them on tall poles and away from trees. Ordinary fencing does not keep raccoons out of gardens or poultry houses. If they cannot go under or through a fence, they climb over. However, raccoons and most other small animals may be repelled by adding a single electrified wire strand to a fence. Place the wire 8 inches from the fence and 8 inches above the ground. Check local city ordinances for restrictions on the use of above ground electric fence. To prevent burrowing beneath a fence, attach a 3-foot wide heavy gauge wire mesh screen to the bottom of the fence so it extends >24 inches outward. Secure the screen to the ground with garden staples and backfill over the mesh with rock mulch. Raccoons are classified as furbearers in Indiana. Under state law, landowners or their tenants may take furbearing animals at any time if they are causing damage. They can also be taken during the legal hunting and trapping season with the proper license. Other furbearers include beaver, mink, skunk, weasel, opossum, muskrat, fox and coyote. Trapped furbearers must be relocated within the county of capture or euthanized. Permission from the property owner must be obtained prior to releasing an animal on their property. 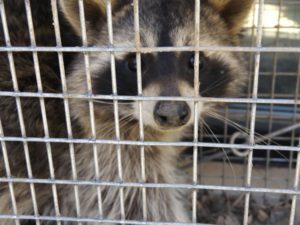 Homeowners who have trapped and relocated/euthanized raccoons must report it to IDNR within 72 hours of their catch. Individuals with nuisance wild animal control permits can assist homeowners with nuisance raccoons. The names of licensed nuisance wild animal control operators and additional information can be obtained from the Indiana Wildlife Conflicts Information Hotline at 1-877-463-6367.